Fumed Silica - a safe, lightweight thickening agent for all resins. Fumed Silica (Cab-O-Sil® is its commercial name) is a very lightweight agent (a thixotrope) used for thickening products such as resins. Available in three sizes of minimum 50 gms (approx: 1 litre), 150 gm (2.5 litres) or 5 litres (300 gm) pots. 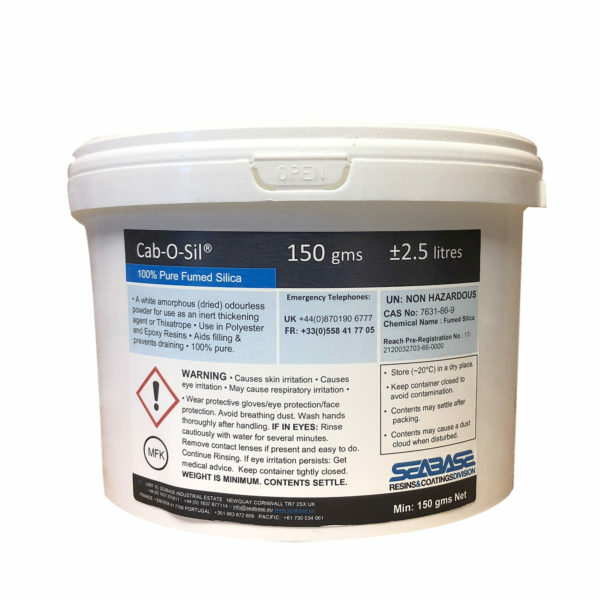 Fumed silica is a light and easily blended thickening agent, ideal for preventing drainage and in creating gels for use on vertical surfaces and as fillers. Note: Cab-O-Sil® – fumed silica – adds little structural strength to resin unlike Glass Bubbles. Fumed Silica or Cabosil (Cab-O-Sil® is its commercial name) is a very lightweight agent (a thixatrope) used for thickening products such as resins. Available in pots of 50 gms (minimum – approx 1 litre), 150 gms (2.5 litres approx), and a 5 litre bucket (300 gms minimum) Fumed silica is a lightweight thickening agent, ideal for preventing drainage and in creating gels for use on vertical surfaces and as fillers. (Note: Cab-o-sil® – fumed silica – adds no structural strength to resin, unlike Glass Bubbles). You even get free reusable resin proof buckets. Blend well with catalysed resin (Polyester or Epoxy) to a gel consistency. Generally non hazardous, but floats easily and can be a dust nuisance. Wear a mask! To thicken resin, add 1% by weight. To make a very thick resin – or gelcoat – add 3.5% by weight. Cannot be easily mixed by machine. Resins containing thickening agents are called thixotropic. Need a 300 gm bucket? Note: This product is not recommended where structural integrity is pre-requisite. Use fibreglass, fibreglass powder, CSM or milled fibre where a more secure fixing is required.